We also had the best program for our meeting on May 14. We learned what John Studebaker, Mark Twain, US President Grant, John "Cockeye" Johnson, Charley Parkhurst, Hank Monk and Bette Davis all had in common. They stayed at the historical Cary House in downtown Placerville. 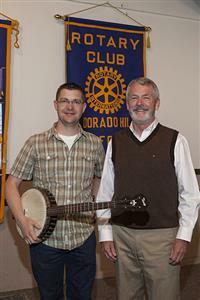 It was exciting having Lanny Hardy tell the colorful stories of our past while Josh Tharp played banjo music of that period. Everyone had fun trying to identify the persons in their presentation. Afterwards, President Coy Baugh presented Lanny with a special matted photo of the Cary House, which was taken by member Laurie Edwards.